FFP was not the only portfolio company that reported annual results yesterday: PV Crystalox Solar also released their results. But unlike FFP it wasn’t all good news for Crystalox, and including yesterday’s decline the stock is now down ~65% since a year ago. Luckily the stock has been one of my smallest positions because the company already partly liquidated at the end of 2013. Since the management team had shown to be shareholder friendly I was happy to see if they would be able to turn the business around. Given the price decline and the availability of the latest results I thought this was a good moment to reevaluate my position in the stock. Is this an opportunity to add, or should it be jettisoned from the portfolio? 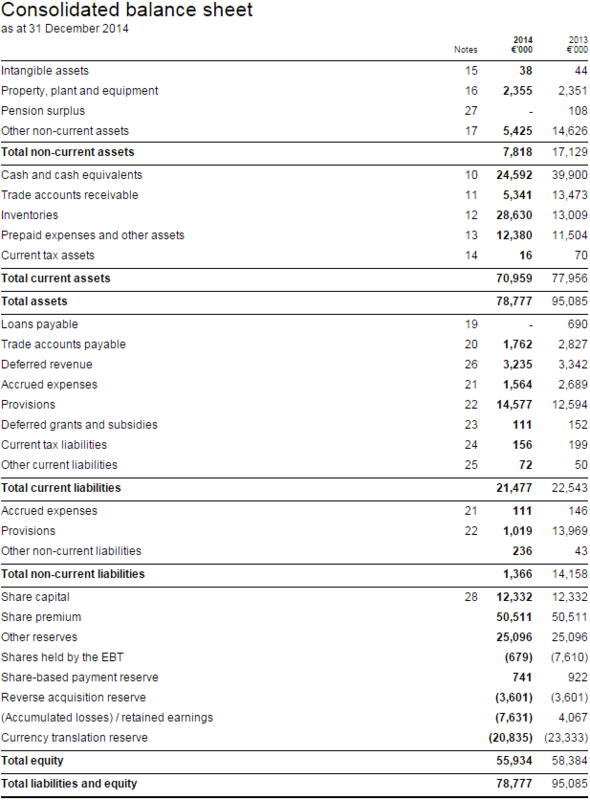 What we see here is that on the asset side the two biggest items are the cash balance and the inventory. While the solid cash position is nice, it is worrying that a lot of money has disappeared compared to the end of 2013 while at the same time the amount of inventories has ballooned. This is caused by the fact that the company is locked in (unfavorable) contracts to buy polysilicon (the raw material needed to create solar panels) while their production levels are very low. They try to trade the excess polysilicon, but obviously they haven’t been very successful in 2014. 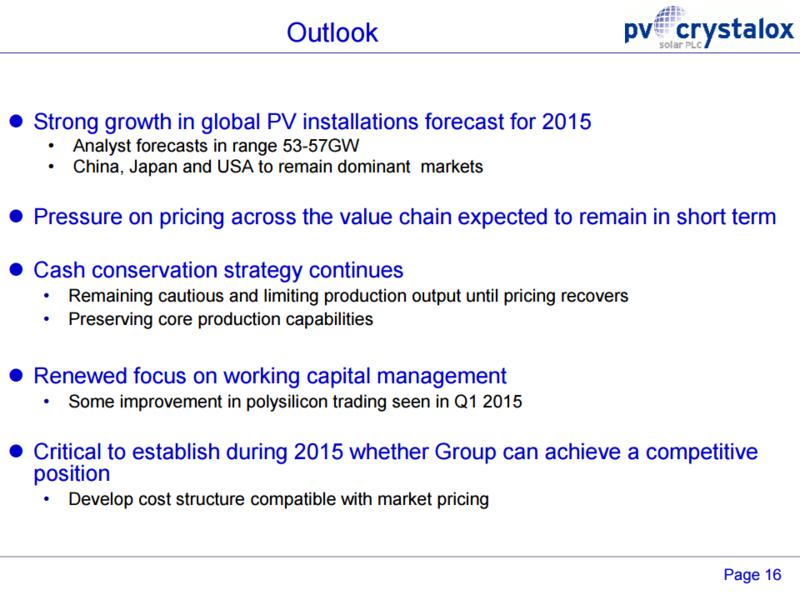 In the presentation that accompanied the results the company writes: “some improvement in polysilicon trading seen in Q1 2015”. So hopefully they will be able to turn some inventory back into cash soon. These gains were offset by €9.7m of additional provision required as a result of movements in pricing assumptions where it has been seen over the past six months that the polysilicon sales price the Group has achieved no longer reflects the spot price. As such whilst quarterly negotiations have resulted in a ‘predictable’ purchase price (in that movements have broadly reflected spot movements), the price at which polysilicon can be sold has reduced resulting in an increased loss and therefore an increase in the provision. Given their statement about better trading conditions in the first quarter of 2015 I think that at the moment the company is not at risk of needing to recognize more provisions, but of course anything can change during the rest of the year. The company has absolutely no influence on the pricing of polysilicon, and it’s certainly not a very predictable and rational market. When I decided to hold on to my Crystalox positions one of the attractions was that management promised to operate roughly cashflow breakeven while trying to wait for better times. They did indeed manage to generate some operating cash flow in 2013, but operating cash flow was a very negative €15.6 million in 2014. The main cause of this was the increase in inventory: without growing inventory levels operating cash flow would have been a more manageable minus €878 thousand. This doesn’t mean that I think operating cash flow breakeven is in the cards for 2015 if inventory levels don’t increase further. In 2014, they received a €8 million payment from a customer that had defaulted, and they generated a lot of cash from liquidating accounts receivable and other assets. They do expect another payment from a customer settlement in 2015, but that payment should be significantly lower than the €8 million received in 2014. Another long-term customer is simply not willing to pay, and Crystalox is trying to seek resolution through arbitrage by the International Court of Arbitration of the ICC in Paris. The EBITDA estimate is a crude proxy for operating cash flow in 2015 and ignores the fact that they will need to spend a bunch of money to eliminate the onerous contract provision. While I don’t like to turn cold hard cash into raw materials inventory it’s the last year that they have to deal with this burden, and exchange rate movements should lessen the blow. Given exchange rate movements in 2015 we could perhaps expect a similar currency gain. That last bullet point seems to suggest to me that they will consider liquidating/selling the company if they are unable to develop a cost structure that allows the business to make money. You can’t expect to find a solid business trading at 40% of NCAV, but considering the price I think Crystalox is actually alright. The business prospects are at the moment crap, but their balance sheet has a low amount of leverage and there is a large cash position. They are going to lose money next year: perhaps something around €10 million. Not pretty, but manageable with €48 million in net current assets. Most importantly I don’t think I have to worry about a cash burn that will continue into the indefinite future because I trust management to do the right thing if they need to. So taking this all into consideration I have decided to more than triple my stake in Crystalox to a portfolio allocation of a bit more than 2%. It’s still not a big holding because I think you want to be reasonable diversified when you buy crappy net-nets. This entry was posted in Portfolio and tagged PVCS.L on March 20, 2015 by Alpha Vulture. Great post! I also find this to be pretty great value. What’s the go with the shares outstanding count? I see it reported as 160m. Yes, that’s the correct number. Ah sorry – ignore me, looking at the wrong thing. Did I miss out something, equity 55.9m and mkt cap is 1.5b???? Hi, any thoughts on today’s results? Operational results are obviously very bad, but it is trading at a 50% discount to NCAV. In the interim report, the company writes that they will conduct a strategic review before the end of this year, and I think the result of that review should be and will be a liquidation of the company. At a 50% discount to NCAV that should create a good return. But of course we’ll have to see if that is really going to happen.